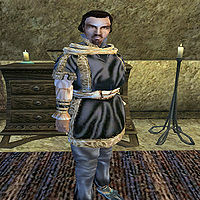 Crassius Curio is an Imperial noble and a Councilor of the Great House Hlaalu, who owns a manor in the Hlaalu Plaza of Vivec. To become Hlaalu Hortator, part of completing the Fourth Trial in the Main Quest, he may request that you give him a kiss, and will also refuse to sponsor you in Great House Hlaalu until you undress for him. He will ask these favors regardless of your gender. Curio is rumored to be a great patron of arts, having commissioned some artists to do a mural for him. Curio is also a writer, having written the plays "The Lusty Argonian Maid" and "The Dance Of The Three-Legged Guar" (which does not appear in the game). He wants to start a theater troupe and likes to be called "Uncle Crassius." He owns a copy of the rare skill book, Lord Jornibret's Last Dance. Despite his eccentric qualities, Crassius is one of the few in House Hlaalu who is truly against corruption. Many of his quests deal with ending the corrupt reign of Odral Helvi in Caldera, during which you can either complete the shady quests according to Helvi's orders or ask Crassius what to do. He wears an extravagant shirt with matching pants and shoes. He carries a copy of his play, The Lusty Argonian Maid. Aside from his natural charm and ability to absorb fatigue from others, he knows the following spells: Resist Fire, Seryn's Gift, Cure Poison, Balyna's Antidote, and Free Action. "Yes, I'm Crassius Curio, but you can call me Uncle Crassius." "I'm so glad to see you again, %PCName." [Disposition +4.] "Yes, I see we're going to get along just splendidly, sweetie-pie. You'll go far with my support. You're now a %NextPCRank of House Hlaalu." "I'm glad you stopped by, %PCName. I may have some business to discuss with you." "Have you done any more business with Odral Helvi? If he asks you to do something suspicious, keep me informed, and I will reward you, pudding." "I can't advance you if you don't belong to House Hlaalu, can I dear?" "No one questions your unshakable dedication to House Hlaalu, dumpling, but you need to work on those skills." "You'll still have to earn your advancement, dumpling. No, no, no, you can't just wiggle that snug little waist and change my mind this time." "You're an ideal candidate, dumpling, with all the skills we Hlaalu look for... But you just haven't done enough favors for me and the others in House Hlaalu." "I can't talk about business to anyone who doesn't belong to House Hlaalu, sweetie." "Speak with Odral Helvi in Caldera. Turn your charms on him, sweetie, and talk about business. If you feel his request is questionable, speak with me for further directions. Keep Uncle Crassius well informed, and I'll reward you." "You're doing well, dumpling. Just speak with Odral Helvi again and keep me informed." "Ah, yes. That is my name. But it sounds like music when you say it." "So he asked you to deliver orders to Tenusi Lladri instead of Baren Alen, the Treasury clerk? This is interesting. Give the orders to me instead, pudding, and I will take care of everything." Here they are. [Disposition +15; Treasury Orders has been removed from your inventory; 500 Gold has been added to your inventory.] "Good, good. Now we have some proof of Odral's corruption, but it takes time for the wheels of law to turn. I will make sure these orders are... edited, sealed, and delivered to Tenisi Lladri. For being a sweetie and keeping me informed, why not take this gift of 500 drakes? Buy yourself something pretty for Uncle Crassius." "You've already given me the orders, pudding." Nevermind. "Well, I wouldn't advise giving them to Tenisi Lladri. You don't know what you might get involved in. I wouldn't want anything to happen to you, dumpling." Crassius Curio thanks you for killing Reynel Uvirith if you aren't Hlaalu, and his disposition towards you improves. If you are over level 20, he will ask you "Well. If you are the Nerevarine, why haven't you..." even after Dagoth Ur has been defeated. He will sometimes offer to be your sponsor even at Hlaalu rank Retainer. The conditions for triggering this bug are unknown, but it might be necessary to first trigger the bug 'Join House Redoran or Telvanni and Hlaalu'. ? This page was last modified on 23 November 2018, at 06:37.